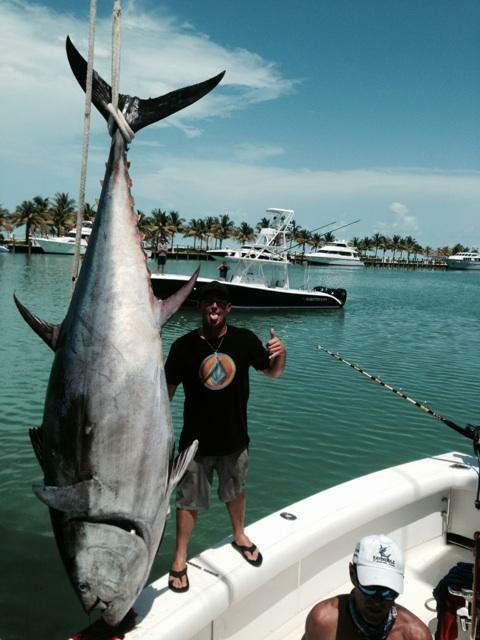 A giant tuna was caught by Capt. Rod aboard the Kaydiddle on a fishing trip that left Fort Lauderdale. The boat went 60 miles offshore, to just outside the Bahamas. Giant tuna come through the pass between the Bimini islands out into the Gulfstream current on their migration northward. On this fishing mission, most of our fishing was done without even baits in the water. We patrol the waters with baits ready to launch if we see a tuna coming through. These tunas are moving incredibly fast, more than 20 knots. The boat has to go full throttle to get in front of them and drop back our baits. Well, luck was on our side that day as we sighted a giant tuna coming off the bank. We gunned the boat ahead and got in front of him and dropped the baits back to him, right on top of his head. INSTA-BITE!!! The tuna hit the lure with an explosion that looked like a depth charge. The 130 Penn International we were using tweaked over in the rod holder as the tuna sounded downward to the depths. Our angler, Charles grabbed the rod and got strapped up into the fighting chair. The fish fought us for over 3 hours, testing the equipment, the boat and all our strength. When the fish got to the boat, we stuck the flying gaffs in him and began another challenging task of hauling the fish aboard. We had no idea the fish was so large. We brought this fish back into Cat Cay where we had to have a forklift, lift the fish out of the cockpit. There was no scale large enough to weigh this fish, but we estimated it at 750-850 pounds. It was an incredibly exciting day. Bahamians from the entire island and some from the neighboring islands came and loaded up on tuna meat. There was enough fish to feed the entire island for more than a week. 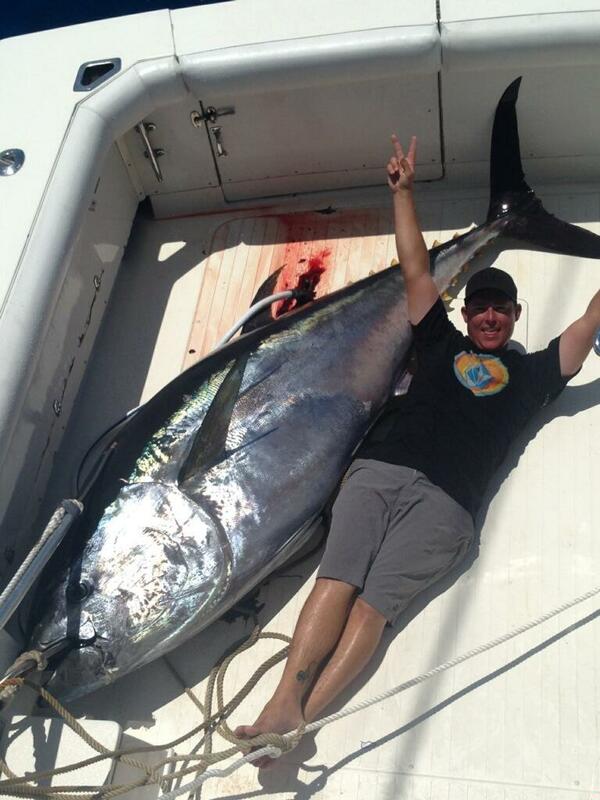 I’ve never caught a giant tuna until this one. What a trip! The giant fish are biting, this is a great time of year. Let’s go fishing!